This Starbucks Cafe Is Telling People To Go Vegan In The Best Way Possible! An Amsterdam Starbucks is making headlines this week with a handwritten sign, encouraging customers to “go vegan” with some of the chain’s delicious dairy-free drinks. The sign, which was shared on Reddit, shows five dairy-free options—some of which are made with dairy alternatives like almond and oat milk—as well as an iced tea. 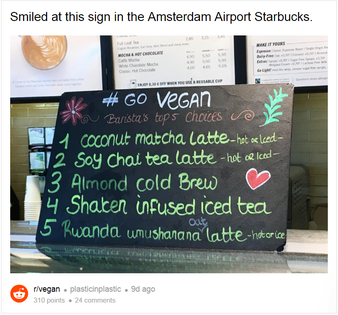 The signage features “barista’s top five choices” listed under a text that reads “#GoVegan.” The five drink options the branch is promoting as vegan are Coconut Matcha Latte, Almond Cold Brew, Shaken Infused Ice Tea, Rwanda Mushroom Latte, and Soy Chai Tea Latte—the latter of which typically contains honey. 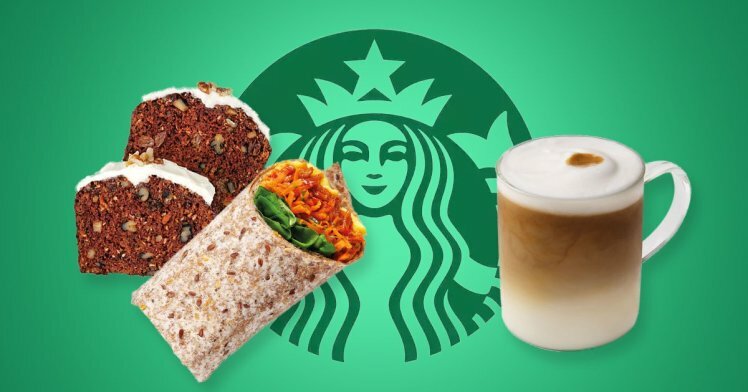 This year alone, Starbucks has added a ton of yummy vegan options to its food menu! In the U.K., these options include two new wraps—a falafel and slaw wrap and a kale, jalapeño, and slaw wrap—as well as a few new desserts, including a chocolate-raspberry cake and a mango with lime fruit pot. And Starbucks locations in the States aren’t far behind; the company recently unveiled a completely plant-based lunch bowl and in May introduced a drool-worthy baked treat: a certified-vegan macadamia-oat cookie! 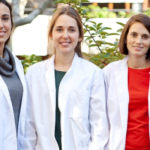 As more people discover the animal cruelty and vast environmental destruction, inherent in milk production, they’re consuming less dairy or ditching it altogether in favor of plant-based foods. Restaurateurs and food producers are taking advantage of this expanding market by adding more plant-based options to their menus and product lines. Fortunately, with the growing number of delicious vegan options already on restaurant and cafe menus far and wide, there’s never been a better time to add more veg meals to your diet. Click here for 145 perfectly balanced, delicious vegan recipes that will help you stay full, satisfied and nourished on a plant-based diet.